Senior Political Leader of Hamas Ismail Haniyeh. Ismail Haniyeh, a senior political leader of Hamas, recently announced his movement's commitment to respecting "any peace deal" with Israel approved by Palestinian referendum. Stating Hamas' desire to be "part of the solution, not the problem," Haniyeh went on to proclaim Hamas' commitment to "establishing a viable Palestinian state with full sovereignty on the land … occupied in 1967." Such statements are, to be sure, revolutionary for a rhetorically religious, but politically motivated, movement infamous for their historic rejection of all peace agreements, the state of Israel and compromises of any sort. 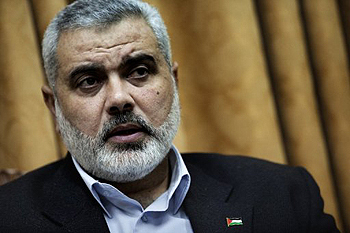 Unsurprisingly, the Israelis readily dismissed Haniyeh's statements, noting that if Hamas had wanted peace it should have done so when it represented the unified Palestinian electorate following the January 2006 Palestinian legislative elections. Reflecting the common perception that Hamas made no movement toward greater moderation, the Israeli reaction to Haniyeh's speech overlooks critical insights and empirical trends that emerged during the brief period of time when Hamas was fully integrated in Palestinian politics. During the time when Hamas stood as the representative government of the then-unified Palestinian people, a fascinating experiment with potentially profound implications for peace in the Middle East began to unfold. It offered the possibility of settling an age-old debate regarding the power of political engagement to transform ideologically driven movements with terroristic pasts into compromising pragmatists capable of solving disputes both peacefully and politically. While such concededly risky experiments had born fruit in the past—think: the Palestinian Liberation Organization, the Irish Republican Army, and the African National Congress, among others—few had faith that such a transformation would characterize the Palestinian Hamas, a movement with a violent past and a charter committed to Israel's annihilation. Yet certain hopeful trends emerged during the roughly 16-month period that, when closely examined, seemed to powerfully affirm the moderating, even secularizing, impact of politics on violent, religiously driven movements. One can measure Hamas' ultimately preempted transformation by examining its responses to the International Quartet's three demands: the recognition of Israel, the renouncement of violence and the acceptance of previously negotiated agreements. Despite the fact that such demands required Hamas to not only renounce the very purposes for which it was created, but to reject what it considered religious mandates, it arguably made significant progress toward each of these demands, even if never going far enough to satisfy the Quartet. The demand to recognize Israel cut to the heart of Hamas' mandate to establish a Palestinian state and to eliminate Israel. Yet, in the wake of Hamas' electoral victory, and in the face of intense international pressure, Hamas offered a variety of rhetorical concessions unprecedented in the history of Hamas-Israeli relations. In the first public acknowledgement of a relationship with the Israeli state, Haniyeh, upon assuming the position of prime minister of the Palestinian National Authority, announced his commitment to cordially maintain all "necessary contacts in all mundane affairs: business, trade, health and labor" with the Israeli state. This was quickly followed by a series of other unprecedented concessions: an agreement to allow President Mahmoud Abbas to conduct negotiations with Israel on behalf of the Hamas-led government; a promise to "respect" and "honor" past international agreements made with Israel; a statement published on the Hamas website confirming that "there is no religious prohibition against negotiating with Israel;" an announcement that the "Palestinian people" (rather than Hamas) should decide the fate and extent of the Palestinian-Israeli relationship; and, in what came closest to absolute recognition, an affirmation of the Israeli state's "geopolitical reality," which Hamas vowed to "coexist in peace with" under certain conditions. A similar transformation occurred with regard to Hamas' commitment to resisting the Israeli occupation using all necessary means, notably including violence. To be sure, Hamas continued to embrace this "fundamental right" throughout its period of political integration; however, it was modified to an extent never seen before. Elected Hamas members, such as Yihiyeh Musa, publicly denounced suicide bombings as a thing of the past—rooted in desperation and inappropriate for the "new era"—and spoke frequently of the need to avoid provocations, honor cease fires, and, more generally, to maintain peace and avoid conflict. Finally, while Hamas refused to relinquish its right to armed resistance, political leaders publicly emphasized that violent forms of resistance were a last resort and should be utilized only after all other peaceful strategies—the hudna ("long-term truce"), the tahdiyya ("short-term cease fire") and electoral politics—were attempted. Regarding their acceptance of previously negotiated peace agreements, which the Hamas Charter considers "horrendous" and a "waste of time" (Articles 13 and 32), Hamas made similar steps toward moderation and compromise. While refusing to accept wholesale all previous agreements, Hamas significantly moderated its founding position, stating verbally and in writing that such agreements should be treated with "high and national responsibility," "extreme realism" and eventually even outright "respect." Coming closer to outright acceptance than ever before, Hamas formally codified this "respect" of previous agreements in the Saudi-orchestrated Mecca Agreement in February 2007. The Quartet's all-or-nothing approach toward Hamas overshadowed the formidable progress exhibited by Hamas during its period of political integration. Unfortunately, such an approach arguably contributed to the outbreak of violence within the Palestinian community and to the diminishing prospects for peace. The emergence, however gradual and tentative, of a more moderate, compromising, ideologically flexible Hamas during that short period strongly argues for a policy of encouraging, rather than resisting, Hamas' political participation within Palestinian politics. Chrystie Swiney is currently earning her Ph.D. at Georgetown University, where she serves as the Jill Hopper fellow in residence. She served as the special counsel for constitutional and legislative affairs for the U.S. State Department in Baghdad, Iraq from 2008 to 2009, and taught as a visiting scholar at the College of William and Mary from 2009 to 2010. This article was originally published by the Common Ground News Service: www.commongroundnews.com.